Love comes through the stomach - Eco? Bio? Freak! Especially if there are two friends that are addicted to cooking and eating the same way ay you are! Because of these two friendsand some other things I’ve been offline the last couple days, that’s why there where no unplanned articles *twinkle*. Periodicly we meet for cooking at one of our places. A three dish menu is usually the consequence and besides a few exeptions it’s always been delicious! While our cooking sessions we explored lots of highlight foods, amongst others I found my most favorite salad dessing, home made gnocchis, home made napki dumplings, crasy tasty filled figs, wild pig meat that smelled so awesome that it made my vegetarian flatmate try the meat and fillet Wellington, that really is tasty the way as everyone says! We always meet around noon time, otherwise we might end up eating after midnight, wich we already had happend, because the food wasn’t done for a long time. This time everything got a little delayed, life is always creative with it’s delaying tactic, but even with only two people cooking we where way quicker than we expected, at 5p.m. we where almost ready for dinner and we where surprised, since we started really late, around 2:30 p.m. So if you are looking for a 3 dish menu that is quick and a little crasy in it’s combination, this is perfect for you! The starter is by the online recipe website Chefkoch.de and we cut down the chicken that usually comes with it. With the chicken it would have been a main dish, that wasn’t what we where looking for, plus too much meat is too much meat. The dressing acutally went into my dessing collection, it’s awesome! The main dish is by an other blogger: The Anna Diaries. Anna organised an entire tapas night for her and all recipies are here: Tapas night at Annas. The paella is stunning delicious with our without meat, there is no difference in taste. A quick and easy paella recipie, that makes you feel like spain is in your kitchen. Thank you Anna! The dessert is ba an awesome book, that we use a lot and right now I’m checking in with to publisher to see if I am allowed to share the recipie with you and tell you what the book is called. I really hope it workes out! I love those days that are given to cooking or cookies or pralines, combined with great friends, with who you can talk about anything on earth! Thank you J. and M.! We are planning to keep those cooking days alife even tho I’m moving to an other city soon. I’m going to be in Berlin a lot anyways, here are just way too many awesome people, just no ocean and too may weirdos *twinkle*. 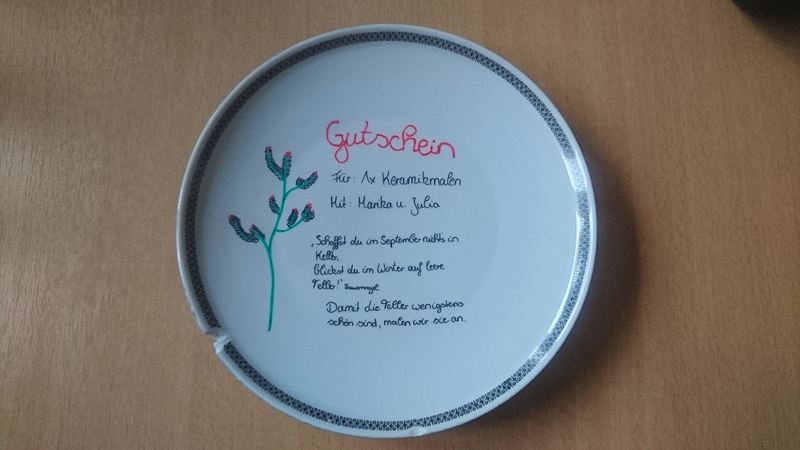 Thas German of cause, and it says: Gift certificate, for 1x pottery painting with M. and me, followed by a farmer rule saying: If you don’t bring in your food in September, your plates will be empty. So we kept saying that we’ll paint the plates so at least the empy plates are pretty *twinkle*. That’s going to be a blast! Have you ever been out for pottery painting? If you haven’t, go for it! It’s where you can be creative without much of rules and you will have something usefull for your home, on top you will be very proud of your own hand painted pottery. Even as a gift hand painted pottery is a great thing, we all know how much we love hand made gifts! Since I told you, that i have friends for cooking, I’m rellay interested in your friends. DO you have friends you always meet for a certain occation, book club friends, shopping friends, bbq friends, movie night friends, hang out friends, homework friends, studying friends, … friends? Tell me about them!